At MedCosmetic, a division of Mirabile M.D. Beauty, Health & Wellness, we offer the latest in non-surgical skin care to men and women in Kansas City, Overland Park and beyond, treating virtually any skin type and condition. Since 1999, MedCosmetic has been providing patients with quality, effective treatments in a professional and caring environment. Our founder and on-site Medical Director, Dr. James Mirabile , is a pioneer in the aesthetics industry. Dr. Mirabile has been responsible for training doctors and medical professionals nationally on laser treatments. 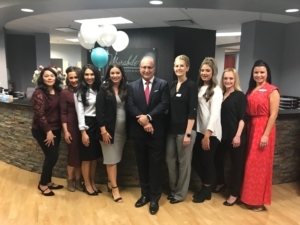 As an invited lecturer and instructor, Dr. Mirabile is renowned for his expertise in the gynecological and med spa industries, and has helped medical offices around the country to incorporate non-surgical aesthetics into their practices. In 2017, Dr. Mirabile was invited to be a Physician Luminary for Cutera, educating other physicians and medical professionals about the use of laser devices in non-surgical skin care. Furthermore, Dr. Mirabile is head of the Scientific Advisory Board for Viveve, the makers of Geneveve a non-surgical vaginal rejuvenation device. Our staff of highly-trained Registered Nurses and Licensed Estheticians prides themselves on providing results-oriented treatment plans. MedCosmetic is proud to be a part of Mirabile M.D. Beauty, Health and Wellness. Under the ownership of James Mirabile , M.D., MedCosmetic , Medi-Weightloss , Bio-Identical Hormone Replacement Therapy and our Gynecology practice (formerly For Women Only) serve patients at 4550 W. 109th Street, Suite 130 (I-435 & Roe) in Overland Park, Kansas. Mirabile M.D. offers Kansas City area patients a synergistic approach to medical aesthetics, weight loss and bio-identical hormone therapy and gynecological treatment. At Mirabile M.D. we treat the whole person – the inside, as well as the outside. We understand that depression, hormone deficiency, migraines or weight issues can be as debilitating as acne, unsightly hair growth, rosacea or wrinkles. We are a one-stop shop for wellness.